Kathleen is an established BBC producer and presenter who has worked on a range of programming for the UK network. 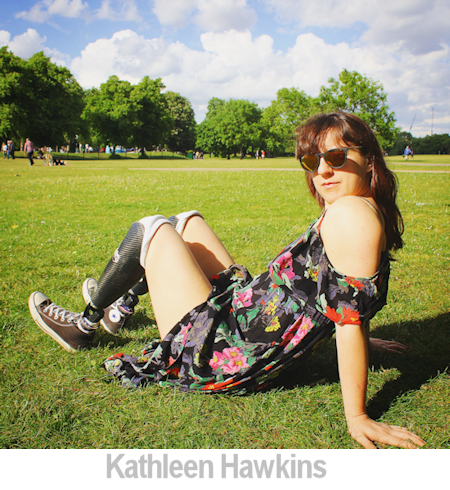 Even after a life-changing illness during her time at university, where she lost both legs below the knee, Kathleen was determined to make it in the media industry. In our interview she tells us about her career that started with work experience at a local newspaper, how she found ways to work with her disability and what it's like to work as a reporter and producer for one of the biggest technology shows on television, BBC Click. Where did your interest in the media begin? I was about 15 and at the excellent newspaper that is The Retford Times doing work experience. I loved writing, and seemed to be fairly good at it, so it seemed like an easy placement, but actually ended up changing the course of life it seems! I do remember being sent out to Vox Pop people in the street though, and being terrified! I sat on a bench for about half an hour building up the courage to go up to people and ask them a really simple question. I think I was nervous most of my young adult life, but when I was at university I begun to find my confidence a bit more. I did an MA in Religion and Public Life and wrote a thesis looking at Islamophobia in the British media. Basically I read hundreds of Daily Mail, BBC, Guardian and Telegraph articles for a year. While researching this I spoke to lots of different people about the issue, sitting down with them for hours sometimes. I knew then I wanted to tell people’s stories, their experiences of this world we all bob along on. Did you have a formal visual media education? Not as such, I did a photography module at university, and worked for the student newspaper but my education came really in 2012 I got a place on the BBC’s Journalism Trainee Scheme. It’s a year long scheme and trained me fully as a multimedia journalist: online, radio and television and well as all the legal training. I got camera trained on the JVC’s and later the Canon FX305, how to edit news packages, short features, basic sound training. Then there was a lot of learning on the job and later extra training, with the Canon c100, c300, DSLRs such as the 5D, the DJI Osmo, lighting courses, and editing on FCP. How did you break in to the world of work? After I finished university I worked doing admin for the uni for a while, and just looking for opportunities to try and get media experience and enjoy myself for a bit. I worked for free at the Yorkshire Post, writing really short little “fillers” like the ‘hot or not’ column, and an occasional feature if I was lucky. Then I saw a scheme being run at the Guardian for disabled journalists who could work there for a two week placement again, unfortunately, for free. I got onto this and spent time ahead of the Paralympics on the sports desk in the London office. Afterwards I got some more work with them, and then I saw the advert for the BBC JTS, applied and got on. 4,000 people applied that year, but I made it. Tell us about your early BBC career. The BBC trainee scheme was a year, and involved training, and then a placement in online, radio and TV news. I was used as a writer on North West Online, and UK News, a reporter and producer for Radio Manchester and a Broadcast Journalist for North West Tonight. Regional news has a huge place in my heart and is honestly the best training ground I could have had. They used me, respected my story pitches and trained me fully on the job. Also I spent a summer travelling around Manchester talking to people and finding out what was happening in people’s areas. It was amazing. Because of my interest in religion and as this had been my area of academic study I wanted to focus on that initially, so I actually left the trainee scheme a couple of months early to go and work for a Radio 4 religious affairs programme called Sunday where they further trained me as a radio producer and I researched, produced and edited for them (the programme is on at 6am on a Sunday morning so there were some early mornings in the studio watching the sunrise and waiting to go live). Then I floated around the BBC as people do. I worked at BBC Ouch, the disability affairs section, shooting videos, writing features and presenting podcasts about all things disability and then moved full-time into shooting and editing shorts for Digital Current Affairs and BBC World Hacks. World Hacks was amazing because we focused on 'the people fixing the world' and went to meet them and find out how they’d made their ideas work. 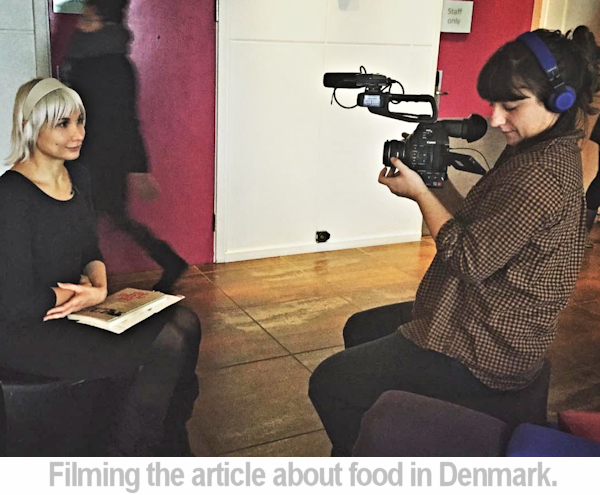 I made this piece for example about a woman in Denmark fighting food waste that did well with 29m views. 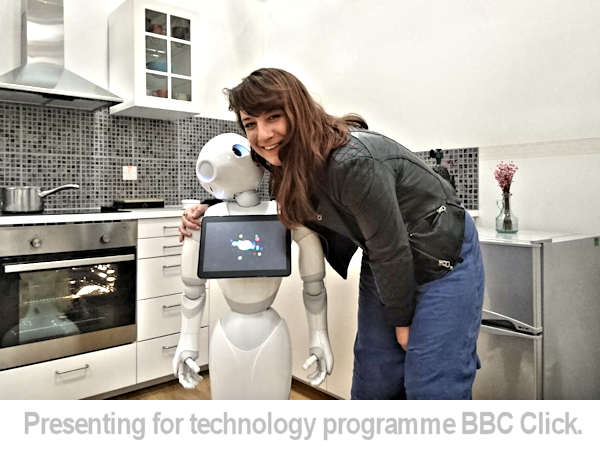 How did you get the BBC Click gig? I was working for Digital Current Affairs when Click got in touch with me to tell me they were running a disability special looking at how tech was being used to help disabled people. They wanted me to do a piece for them and so I travelled to Texas to visit a start-up 3D printing prosthetic leg sockets, and tried them out first hand - with interesting results! I loved making this piece, and Click liked the insight I’d given and my reporting style so when jobs became available earlier this year they asked me to apply. Luckily the interview went well and I started on the team in April. Do you have an interest in technology? I love tech and am a gamer, so yes! What I’m really interested in is the intersection between tech and human lives, how it is used to help people and further human advancement. I love those big questions: the future of work and AI, should robots pay tax, how can we use tech to help people affected by natural disasters, as well as the latest in fun tech. And because everybody at Click is interested in tech it means we always have the latest cameras and gadgets to use and try out in a broadcast environment, which is really fun. Can you tell us what led to you becoming an amputee? When I was in my first semester at university in Leeds I contracted meningitis B, and unfortunately it turned to Septicaemia. I was incredibly ill, had multiple organ failure and was put on life support and rushed to intensive care. My parents were told three times there was nothing more the doctors could do. Because Septicaemia ravages the body, my blood rushed to my organs to try and save them and this meant my legs essentially died and became necrotic. Two months into my four month hospital stay I had to have both legs amputated below the knee. No doubt a huge change to your life from that point, how did you approach these changes? As you kind of have to do when something hugely traumatic happens to you, I went to a safe place and healed. For me it was my parents. I was only 18, and needed support with the most basic of tasks, going to the toilet, getting food etc. The routine was such that I had to get out the house three times a week to go to physio so in some way I just had to keep going through that bit and my parents were always there anyway to make sure I was at least staying washed and fed. I was really determined, I knew I wanted to walk again, and I knew I wanted to get back to university the next year and so I worked hard to achieve that, and did. Other than that for the first six months or so I was pretty immobile so I played lots of video games, read, watched documentaries, had lots of visitors . I weighed 5 stone because I’d had a feeding tube for so long, my hair had fallen out, and my body was full of medication and post operative, so I just mended physically for a few months. I think the hardest thing was that I was a dancer beforehand, and that was my main love, so losing that and noticing such a physical change to my body was really really tough. It’s a case of literally step by step. What were the biggest challenges to your career after this happened? I think the hardest challenges have been times when I’ve just had to take steps back from work to preserve my health, such as getting sores and rubs or infections on my legs and having to go on bed/sofa rest, for example. I’m somebody who likes working, likes being surrounded by creative people, so it can be frustrating for me, but I’m learning to be stricter with myself! I think initially I was worried that I would be seen to be a burden to employers, that they wouldn’t want to support my needs, and would think that I was unable to do the things I want, like filming. I definitely talk to a lot of disabled people who encounter this, and we all need to work to change this perception so more disabled people are given opportunities like I’ve been given. Because that’s how we get better as organisations and businesses and ultimately make better and more interesting stuff, which is what we all want to do. For me, my experience and passion spoke quite loudly I think, so as soon as editors saw that I could shoot and wanted to, and similarly report, they let me do it. The BBC has been a brilliant employer for me in that respect, in that the editors wait for me to shout for help, rather than limiting me from the offset. I think the flip side of this is that because I can appear to be very physically active sometimes I forget to shout, or don’t think about it until it’s too late and I’ve hurt my leg. It’s a fine balance but one I’m working out. You are also a producer, what kind of work are you making? At Click everybody really is multi-skilled and does everything, so reporters also produce pieces for the programme, and lead produce whole episodes, research stories, set up shoots and edit pieces for both the programme and our digital output. Outside of my work at the BBC I also produce shorts and my boyfriend, who’s also a video journalist at the BBC and I work on lots of different ideas together, from short docs to feature films. I love meeting people and finding out what they’re working on, especially at Click because there are some seriously clever people working on all kinds of tech that will change how we interact with the world. I really like the creative process behind making films, thinking about the shots we’ll get, the lenses we’ll use, how an interviewee is lit, right through to the edit and working to create stories. I’m an “all about the journey” kind of filmmaker/reporter. Is there anything you’d like to change? It’s a weekly programme so it’s a quick turn around as it needs to be which can mean that sometimes I’m not 100% happy with something I’ve put out. But this is good experience in letting go and moving on too! I find it really hard to answer this question but I want to work on documentaries and longer form pieces, as both a reporter/presenter but also a PD (Producer/Director). I see myself moving into more investigative journalism going forward but always with the main focus of telling people’s stories, those who don’t normally have a loud voice. I think I’ll always make films within an artistic arena too, whether that’s films about artists or attempting to convey a certain emotion, whatever it may be, I like to work with artists and dancers and be inspired by others. What was the best career advice you were ever given? “We’re all learning every day” has really stuck with me from my time as a trainee and I think it’s great to have that perspective. No question is a stupid question and there’s always something to learn so we all improve and make better pieces. Nobody is a final product and I think if you have this in your mind it’s always it’s been a great perspective giver to me in times of stress. Any advice for anyone with a disability looking to work in the media? Yes so much advice and too much to write here. I’m always happy to answer people’s questions (via Kathleen's website here) and everybody’s experience and disability is different. I think mainly it’s that in the most part people want to help, but quite often they just do not know how, and they feel awkward asking. So think about what you need to help you do your job, how can an adjustment help you and don’t be afraid to ask for it. In a similar way, how much do you need to tell people about your disability so they understand, even in a small way, how it might impact on your ability to do your job. If you’re in pain all day for example, people need to know that because they need to work with you to put you in the most comfortable situation to do your job. Note we cannot be held responsible for the contents of sites you access from these links. All images © Kathleen Hawkins and/or BBC and used with permission. Andy tells us about his career as a radio reporter and TV producer and working with a disability. BBC apprentice cameraman Sam Robinson tells us about his experience as he learns the ropes of working behind the camera.